I'm very excited for today's post; it is one that I have been wanting to do ever since I saw Prep For A Day’s Audrey Hepburn style steal. After seeing her post, I decided that I wanted to do my own based on my favorite fashion icon, Kate Middleton. I picked one of my absolute favorite Kate Middleton outfits and am giving you a super affordable way to get the same look! 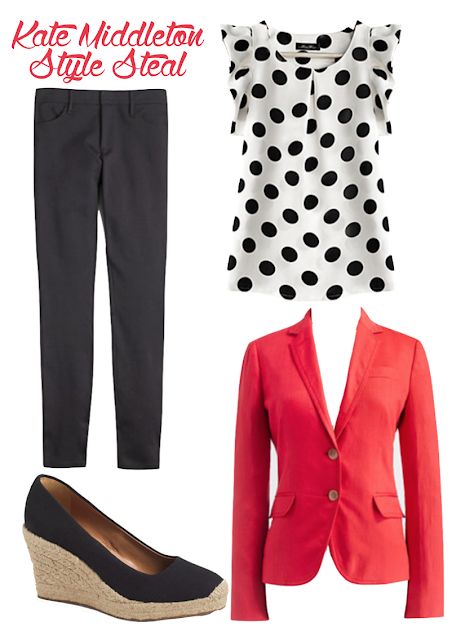 It’s a super classic look with the black pants and the polka dot top, but the red blazer gives that perfect punch of color and helps make the outfit memorable. This picture doesn’t show her shoes, but I imagine her wearing some classic wedges or flats! Let me know if you liked this post, and if you did please let me know what other people you would like to see me recreate their style! This is such a great copy-cat look! I love Kate Middleton's style- she is flawless! Thank you, she definitely is! I absolutely love her style! Great style steal here, Ashley!